Put this together myself. It took a good 4 hours but can be done. It cleans up the garage and is extremely functional. It looks more expensive then it is. Dimensions 108.0 In. X 18.0 In. X 77.25 In. 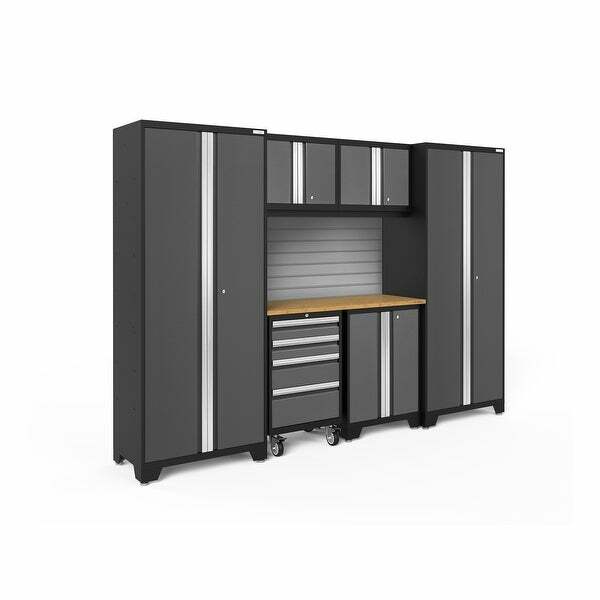 Very spacious storage with adjustable shelves and deep drawers. I got the stainless steel work top with a slat wall backing option. Good quality materials. My garage is well organized and clean. Each individual unit was easy to put together. It was harder to put each of the 7 pieces together into one unit as the screw holes didn't line up perfectly. I have one shelf in the locker that is extremely visually slanted and not level because the manufacture drilled holes that the shelf hooks onto was not level. But, overall, I love the organization it provides. Love this purchase. Also, bought it with 20% off Christmas discount and another 15% off as a returning customer. I got these cabinets for my husband to put in his new garage. They came way faster than I expected them to and they were wrapped up very nicely. My husband said they were easy to put together and provided a lot of storage. He is very happy with the quality of his New Age Cabinets. these cabinets light up the room. its my second set and I am very pleased. Really nice set for the money, the rollout cabinet is a bit light but overall for what you get I was really impressed. Makes our garage look organized and fantastic!!! Great deal! This product is made with good quality material and shipped fully assembled (except for the legs/casters). It was packaged very well and shipped much quicker than expected. This is a must have for anyone's garage! I am very satisfied with this purchase. Absolutely terrific product. Never seen such careful packaging before. The thing comes on a pallet, so be ready! Not much to assemble. Easy to install. Highly recommended. First shipment found several pieces to be damaged. After calling New Age to report the problem they quickly took care of the damaged pieces by sending replacements. The 2nd shipment was received timely and all pieces were free of damage. The setup was quick and now our garage organization begins! This is an awesome set up. It fits everything that I need to store out of site. This is a well made product. It arrived undamaged so cudos to the trucking company as well. great material, easy to assembly and affordable price. how it looked.. the style was the best made..
"Can the slatwall be cut to fit around an outlet?" Good price, matched color I needed, and had the cabinet space I wanted. "Is there REQUIRED attachment to the wall?" The large cabinets and rolling cabinets have legs (wheels for one), so these do not have to be attached to the wall. However, it is recommended you secure the large cabinets to the studs to prevent them from titling over. My garage floor has a slope so I definitely had to secure to the wall to prevent the cabinet from falling forward, especially when opening the doors.